The Non-Proliferation Treaty (NPT) review cycle resumes this year. States Parties will meet at the Vienna International Centre (United Nations) in Vienna from May 2-12 for the first preparatory meeting for the 2020 Review Conference (NPT Prep Com). Registration for the conference closes on April 14. Contact us by April 13 if you plan to attend and would like to be on the PNND delegation. Calls on States Parties to the NPT and civil society to begin preparations now for the HLC to ensure its success. PNND Co-President Saber Chowdhury MP holds the chains preventing a nuclear missile from being launched in front of the German Parliament. 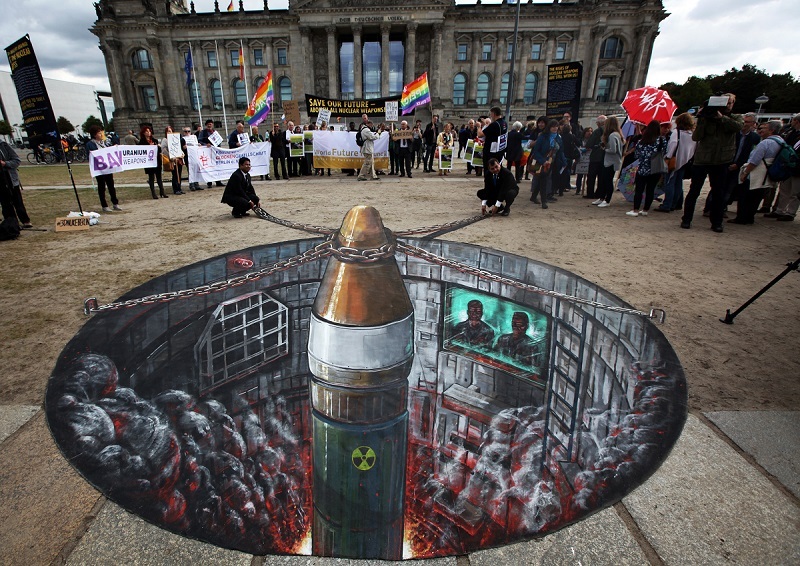 The nuclear missile will be on display in Vienna during the Abolition 2000 annual meeting. PNND members are invited to participate in the annual meeting of Abolition 2000, the global network of over 1000 organisations cooperating to eliminate nuclear weapons. The meeting in Vienna on May 1 will provide an opportunity to build further cooperation between parliamentarians and civil society for nuclear abolition.